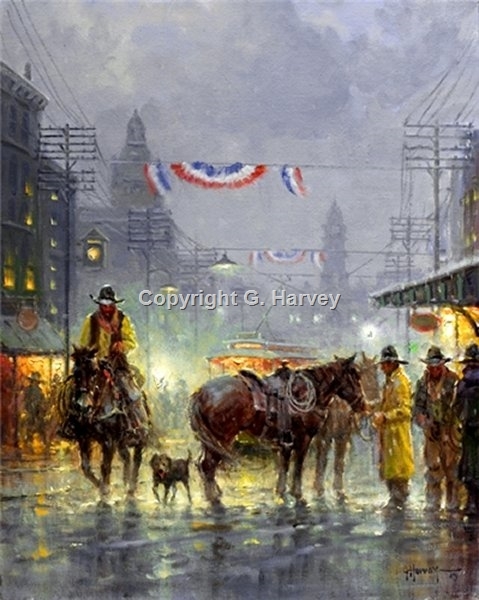 Cowtown Drifter by G. Harvey ~ Texas subjects are special to G. Harvey. He was born and has lived his entire life in the state. The artist is well-known for his city scenes and his Westerns, and "Cowtown Drifter" is a combination of both genre. Based on old Fort Worth, it is a jewel of a piece showing all the hustle and bustle of the city at its peak.